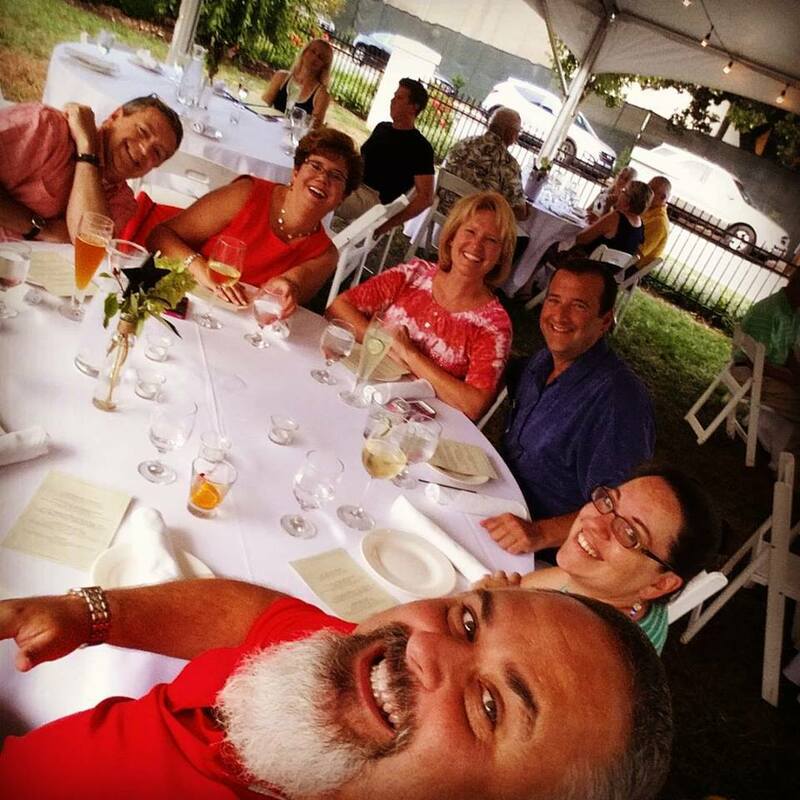 On Saturday, Stephanie and myself were invited to accompany friends of ours to the Annual Luv Luv Festival, the brainchild of Tim Grandinetti, the co-owner/head chef of Spring House Restaurant, Kitchen and Bar. The Luv Luv Festival is a culinary showcase of chefs from all over with great live music. We hadn’t, unfortunately, ever attended the Luv Luv Festival but we had wanted to. This was our first time ever and let’s just say we loved it. Let’s make clear, too that it’s not the last ever festival but the last day of this year’s festival. First of all, we have to start with the company we kept during this festival. Paul & Susan Jones along with Jon & Celeste Lowder were our tablemates and we’re no strangers to each other. In fact, Paul, Jon and I do a podcast called The Beer Dads which is part of The Less Desirables Podcast Network. So we hang out, talk about being dads and drink, you guessed it, beer every week. Our wives have become good friends so we had a very, very fun table. Also, former local DJ personality and Master of Ceremonies of the event, Bob Campbell (who also happens to be the voice over talent for The Beer Dads) sat with us as did our guest of honor, the wife of this evening’s guest chef (Tim Recher), Alicia Recher. We were guests of the Lowders and can’t thank them enough for having us. Good wine, liquor and beer as “the beer dad” ladies had more than a few glasses of white wine and the guys a mixture of cocktails and beer. I believe Paul and Jon preferred the Sisters of the Moon IPA from Mother Earth Brewing while I had one of those and then switched to the Vanilla Porter from Breckenridge. But, as much as we like to think that it is sometimes, the alcohol wasn’t the star attraction of the night. It was the food. Starting off the whole night was a plate of hummus with pita triangles alongside of tomatoes straight from the garden of Chef Grandinetti. This was followed by a large plate of oysters and cocktail shrimp from Rappahannock Oyster Company. 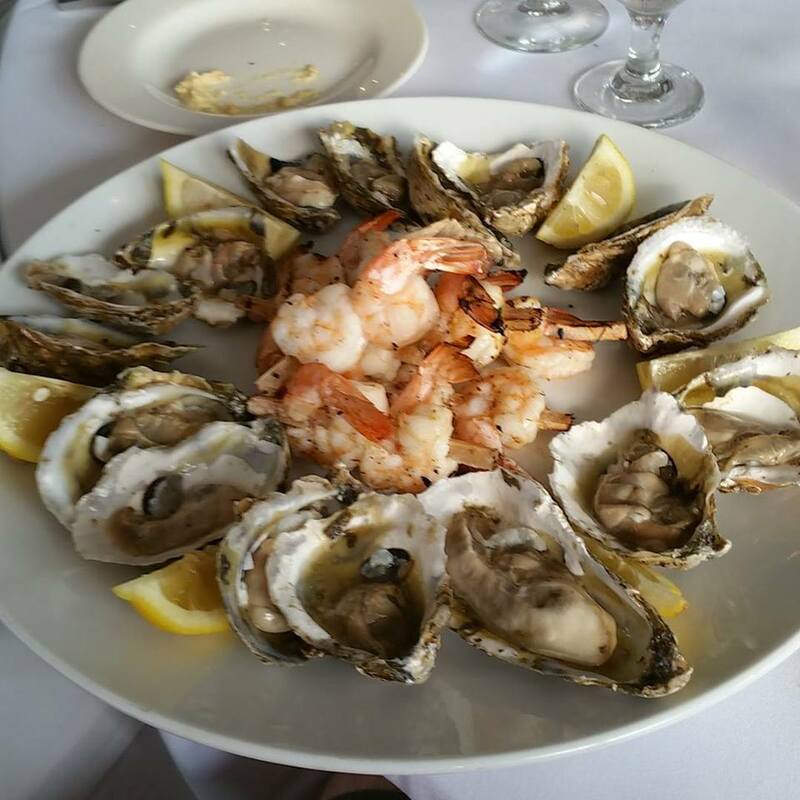 The oysters were raw and delicious. Also served with them were some hot peppers with a sweet glaze of hoisin and sesame seeds. Jon and a few of the ladies mentioned they thought they were hot. I ate several of them and got nothing more than great flavor. I found them to be very mild and almost no heat. Perhaps one of us got lucky, you decide. 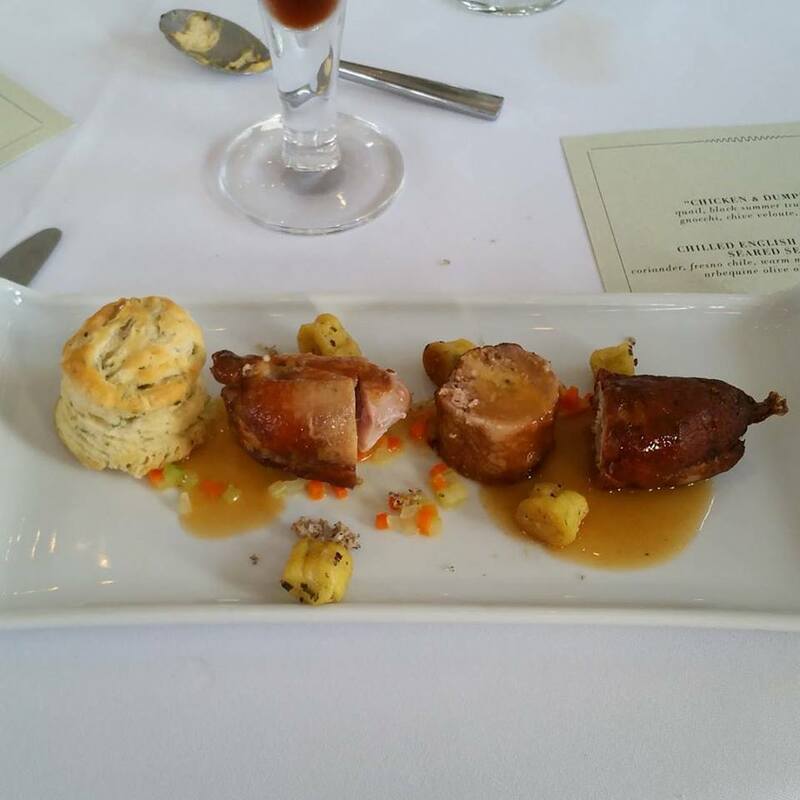 The first course “Chicken & Dumplings” was quail, black summer truffle mousse, gnocchi, chive velouté and herb biscuit. This was a fantastic course. The “chicken” seemed to be a combo of quail and other meats that were served sausage style and while I’m generally not one for quail, not only did I eat all of this, I picked it up and ate the bones like they were a chicken leg. Of course, I was nibbling, but it was so good and the velouté sauce was like gravy and light enough to not overpower but perfect for accentuation. It was easy to sop up the extra velouté sauce with the biscuit and the gnocchi were tender. Let’s say that my plate (with the exception of the bones of the quail) had nothing left on it. It was clean. Wonderful course. 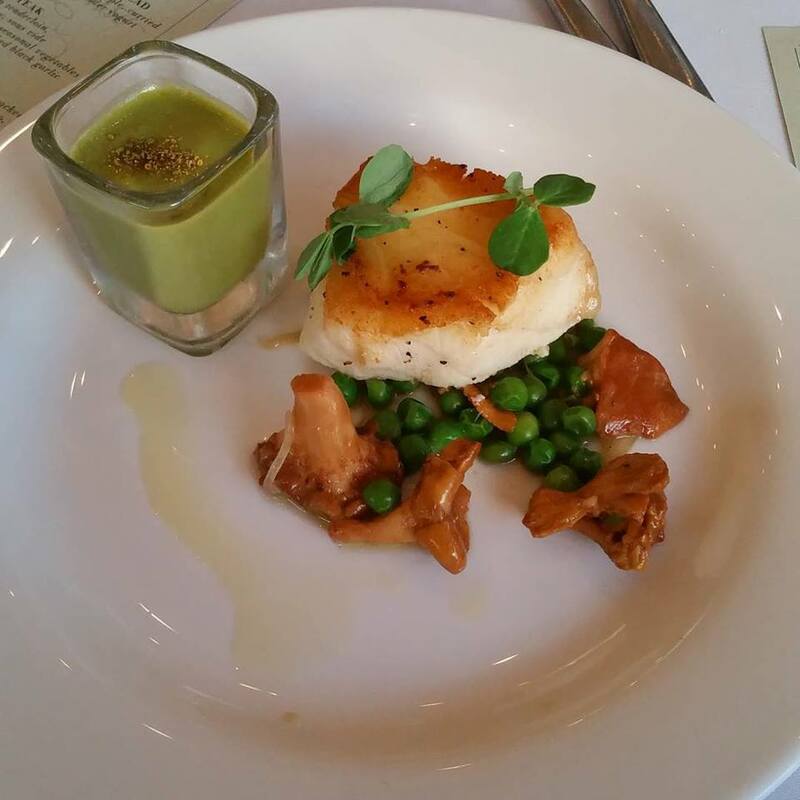 Course #2 was “Chilled English Pea Soup and Seared Sea Bass.” Described as coriander, Fresno chili, warm mushroom-shallot-pea salad, Arbequine olive oil, fennel pollen. When you cut into the fish, it fell apart being a wonderful flaky morsel of flavor. Seasoning wasn’t anything to mask the fish, you got full “sea bass” (or Patagonian Tooth Fish) flavor and that’s a good thing. The peas under the fish were quite fresh and even had Susan Jones, who doesn’t eat peas cleaning her plate of them. 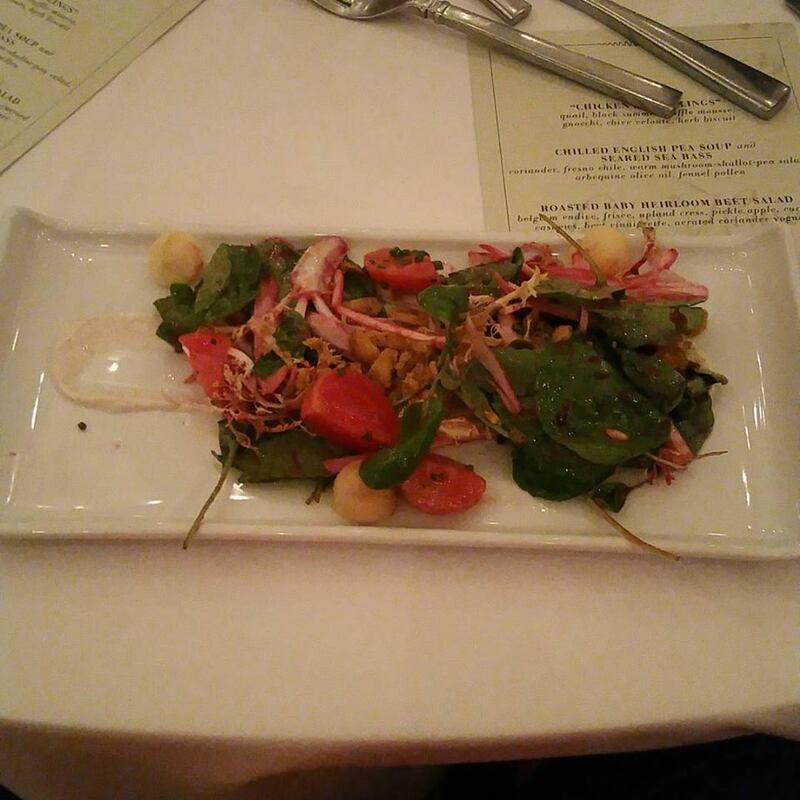 As simple as it is, the cress on top, really set a freshness that I can’t explain in words to the entire plate. The pea soup had the distinctive coriander and chili flavor as it was a tad savory and I loved it. It was topped with the fennel pollen. I had to drink it like a shot because there really was no way to get a spoon in there. But, I think that was the point. I had no problem shooting that soup. Delicious. Course #3 was “Roasted Baby Heirloom Beet Salad.” Belgium endive, frisée (another kind of endive, which along with Belgium endive can be called chicory here in the US, at least from my research), upland cress, pickle apple, curried cashews, beet vinaigrette, aerated coriander yogurt. I’ll have to be honest, was my least favorite course, but when you don’t like beets, or many other like-vegetables (I’m adapting as I get older), then that’s understandable; at least in my mind. I did enjoy the pickled apple and curried cashews. I did eat all the leaves but left some of the endives and most of the beets. Again, the cashews and pickled apple were good. Course #4 was, to me, the pièce de résistance. It was “Back Yard Steak.” Coffee rubbed bison. Vidalia onion ash inlay. 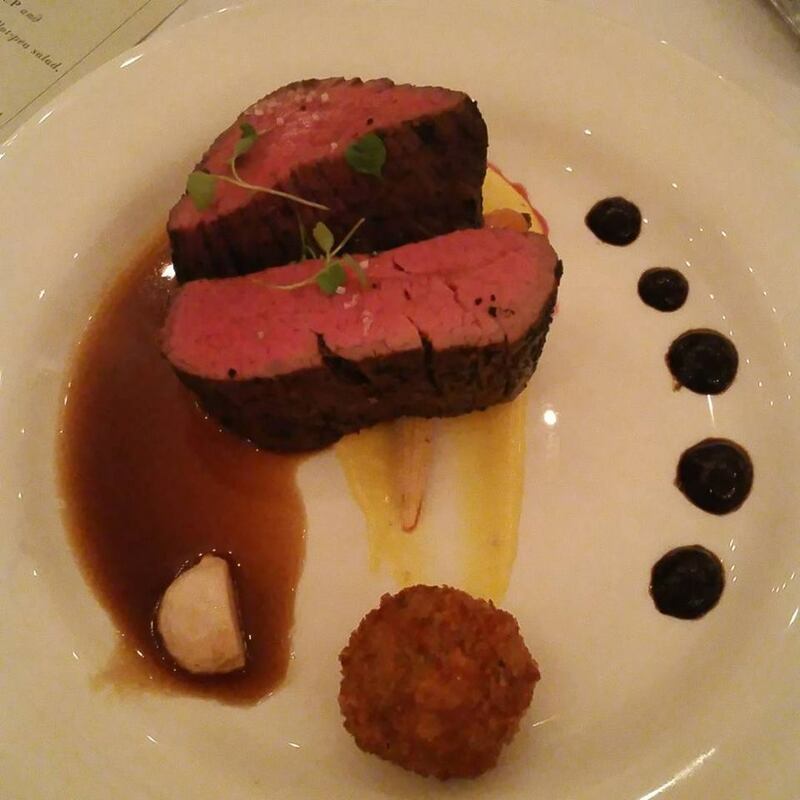 Sous vide smoked brisket & potato croquette. Seasonal vegetables, sweet corn puree, bbq jus lie and smoked black garlic.This cut of bison meat was so tender and juicy that a regular table knife could cut right through it with no problem. It was medium rare and the outsides were perfectly charred and seasoned with the coffee rub. 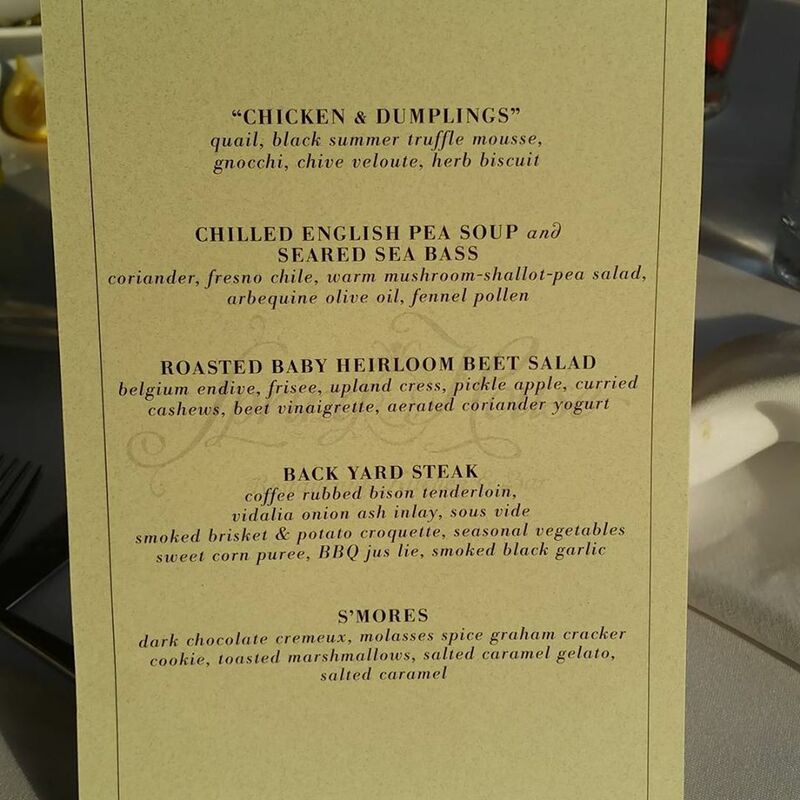 The baby carrot and corn was a nice addition as was the jus lie (pronounced zhoo lee-AY) and vidalia onion inlay. That coffee rub and the meat itself was such a flood of flavor that I ate it with my eyes closed most of the time, enjoying each individual bite. Generally, I’ll tear through food like I’m being graded on it but I took my time and every single chew was documented by my brain. Let’s just say that it was so good that not only did I eat all of mine, I also had the bonus of half of Stephanie’s. She loved it as well, but was filling up. This was a definite 5 on a 5 scale. 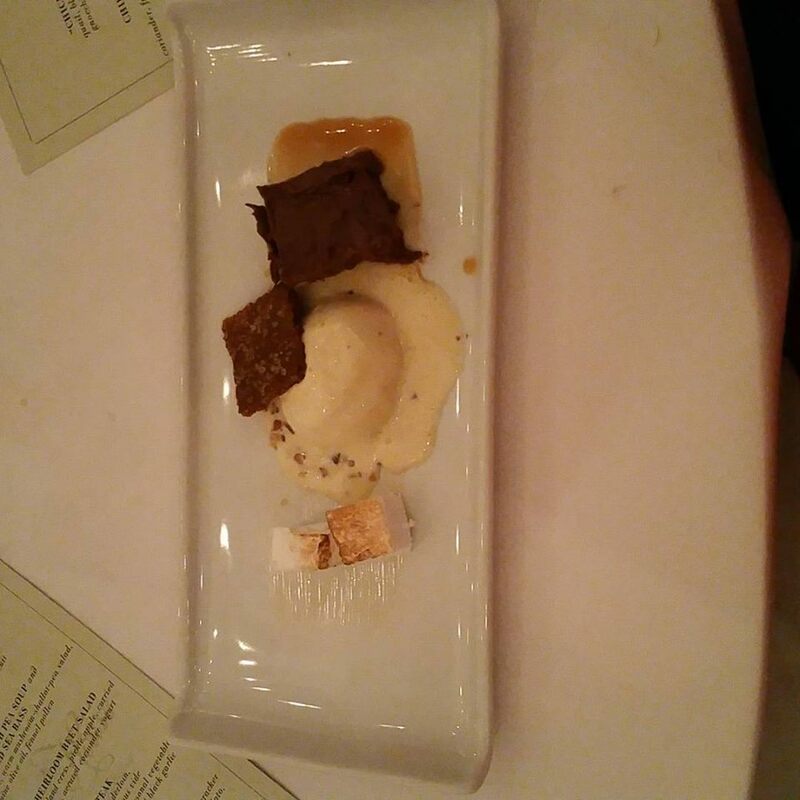 Course #5 was the dessert course which was “S’mores.” Dark chocolate crémeux, molasses spice graham cracker cookie, toasted marshmallows, salted caramel gelato, toasted caramel. Stephanie got her second wind enough to eat this. I thought the crémeux was the absolute best thing about it. It was like eating a very soft, but still firm, piece of fudge. The tiny toasted marshmallow squares were a nice accompaniment for the crémeux. The gelato was a bit melted away by the time I got to it but what I got of it was delicious. I love caramel, so this was a nice finish. Chef Tim Recher, of the Army/Navy Country Club in DC, really brought a wonderful menu and Chef Tim Grandinetti and his team both in the kitchen and the outside wait staff were fantastic support, making this event a true 5 star dinner treat to anyone who was privileged enough to be there. Spring House is always a class act and this was no different. Many thanks to Chef Grandinetti for hosting. Spring House can be found at 450 North Spring Street in downtown Winston-Salem. They’re on the web at springhousenc.com. I had the opportunity to eat lunch with one of my very good friends today and when discussing where we were going to meet, I suggested that we go to the new Greg Carlyle vehicle, Local 27101, the former Millennium Artisan Restaurant. The idea behind Local 27101 is that the food is locally sourced (no, not from the 27101 zip code, necessarily) so that it’s fresh. It’s supposed to be fast and reasonably priced. Greg said, “the people downtown are looking for a fast, $5 burger,” and this exactly that. The menu has many things from the aforementioned burgers (make it a double for just $2 more), po boys, chicken sandwiches, hot dogs, salads (Cobb, Caesar, add a protien, etc) and so on. Sides include crinkle cut fries, sweet potato fries and onion rings. You can add on to your burger with avocado, an over-easy egg, bacon, or caramelized onions. The Local Burger is a quarter pounder with lettuce, tomato, “local sauce,” which isn’t quite 1000 Island but is beyond mayonnaise, and muenster cheese. Another nice touch is the top bun is branded with the logo from Local 27101. I had one with an extra patty, hold the lettuce. The homegrown tomato along with the local sauce made the bread a little soggy as the tomato was really ripe, but it didn’t detract from the burger. You want the burger to be juicy without being wet, save the tomato, it wasn’t wet, it was cooked just right. I think the only thing it was missing was a few dill chips on it.I also had the onion rings with it, which if you know me, you know I don’t like onions, but oddly enough, I can eat onion rings, when they’re good. There’s a good batter on the rings and weren’t overly greasy which is all too common with onion rings from many places. My pal had his a single without the tomato but with lettuce along with crinkle fries. The fries looked to be topped with herbs that are grown in the windows around the restaurant (so there are some things that are local to 27101). The flavors, to me, were exactly what I was looking for good meat, great cheese the sauce was tangy. Again, I could have done without some of the moist bun from the tomatoes but that’s okay, the flavor was worth it. The restaurant itself is a lot of brown and natural wood with each window adorned with herbs to be used in the restaurant. The slat work accentuates the bar area. A very large menu is stuck to the wall and the chalkboard was being decorated as we walked in. They have beer, wine and are formulating a drink menu. How the whole thing works is: you walk in, stop by the counter where the bar is, order your food, get a buzzer, scope your seat and wait for the buzzer. When it buzzes you go to the counter and pick up your silver tray. The bump in the road for me is when you want a refill you have to either jump in front of people at the order counter to get the order taker to refill it or alert someone else to do it, or you have to wait until someone notices you’re there and waiting. We did wait for a bit, but not too long. Another thing is that they serve the burger with the bun already on the burger. I know it’s an aesthetic thing but the presentation would be better if the top bun was off to the side. We often eat with our eyes and it would make the burger even more attractive; but that’s no deal killer They have a few kinks in the system to work out but I think that Greg finally has something on his hands that will be a boon for him, for the downtown lunch crowd and the downtown foodies and their searches for a good and affordable burger. For now, they’re open only for lunch but sometime in September, probably after Labor Day, they will also be open during the evening, keeping the current (and presumably constantly modified) lunch menu as well as some dinner options. 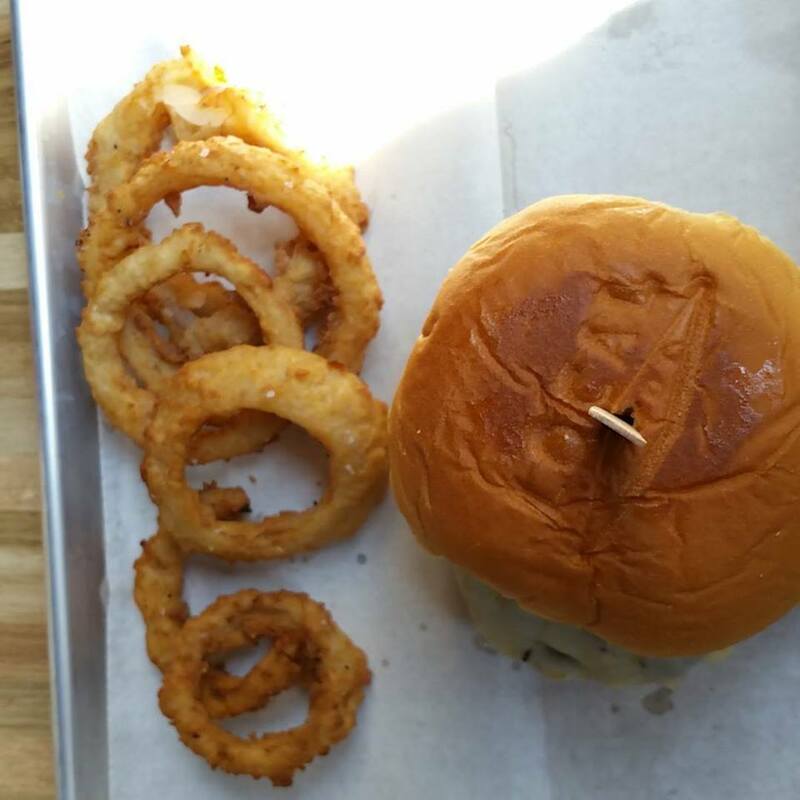 Greg also said to expect a “true blue plate special.” You can get your own $5 fast burger at Local 27101 which is located at 310 W 4th Street in downtown Winston-Salem. Their website and Facebook pages show the menu to get your ready to experience the good food. It’s good, it’s fast, it’s easy, it’s Local 27101.